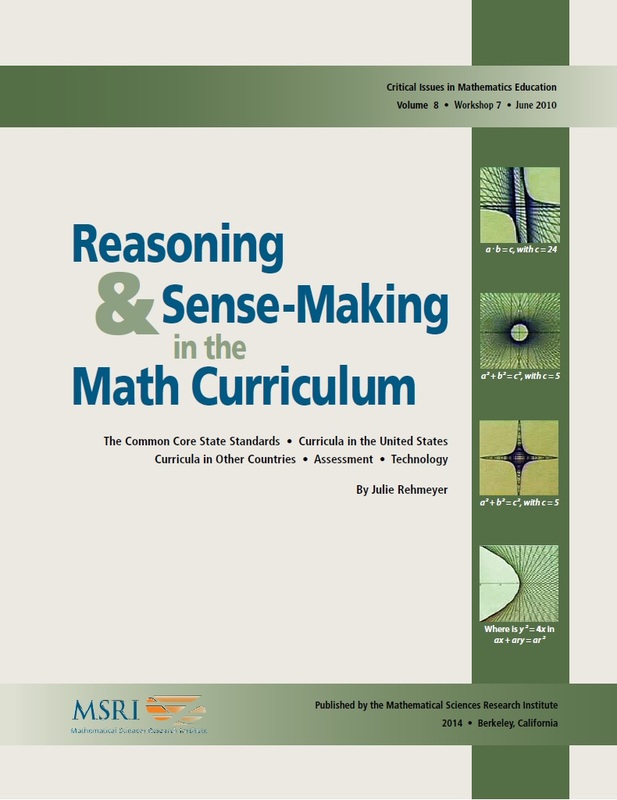 CIME - Reasoning and Sense-Making in the Math Curriculum - Workshop 7, June 2010 The National Council of Teachers of Mathematics has just released a new document, Focus in High School Mathematics: Reasoning and Sense-Making. The Council of Chief State School Officers and the National Governor’s Association have initiated a state led effort to produce Common Core State Standards, which they hope will move states toward national curricular coherence. The national scene is being transformed through stimulus money aimed at having states adopt common standards. This is a significant time for mathematicians to weigh in for coherence and a focus on thinking, understanding and sense-making. For this reason MSRI will host the seventh Critical Issues in Mathematics Education Workshop on this topic. Themes of the workshop will include international comparisons, the role of a coherent national curriculum in the teaching of mathematics, and the ways in which technology can be used to support reasoning and sense-making. The workshop will start at 9:00 AM on June 7, and end at noon on June 9. Please find the contact information of the officially registered participants in the Participants contacts. The workshop will start at 9:00 AM on June 7, and end at noon on June 9. Please find the contact information of the officially registered participants in the Participants contacts.